Frank Istueta has 29 years of experience in the construction service industry. He started as a handyman and learned different trades in construction and always had a big dream of creating his own company.He became an entrepreneur and started his dream by creating Istueta Roofing in 1985 to provide roofing services in Miami, Florida. 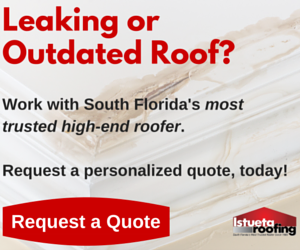 Istueta Roofing has won many awards in the remodeling business, including the Top 500 Re-modeler Award for the years 2005-2010, Top 200 Exterior Contractors in the nation from 2007-2011, the Top Roofing Contractor Award for the year 2008 as published in the South Florida Business Journal, and the Certified Contractors Network 2013 Company of the Year. Frank was recently inducted into the Remodeling Big50 class of 2012, becoming one of only 50 re-modelers in the nation to receive this honor in the year 2012. Many of his team members at Istueta Roofing have been honored in previous years with awards from Certified Contractors Network, and they’ve also collected hundreds of valuable testimonials from happy clients through the years because of their unparalleled service. Servicing the most prestigious communities with thousands of completed projects produced satisfied clients in Miami, Grand Cayman, Puerto Rico, and Turks and Caicos. Frank has become an authority in the roofing business and the remodeling industry. His company provides a large range of services closely related to roofing such as, waterproofing, gutters, painting, coatings, architectural metal and a unique Platinum Client Maintenance Program for select clientele in Miami. Frank has been married to his wife, Leticia, since 1986. They have two sons and a daughter.